The Insurance Council of Texas puts the total damage at $425 million. CARROLLTON, Texas -- The weather is long gone, but the damage is here to stay -- at least for a little while. "It just sounded like somebody was throwing mud clods at the walls -- and everything just started crashing," said Rosemary Fougerousse of Coppell. Rosemary Fougerousse and her husband, Richard, had their home and cars hit hard by last week's hail storm. They've brought two banged-up vehicles to a mobile State Farm Insurance claim facility in Carrollton. "It was too dangerous. The hail was just too loud, and it was lightning. We just couldn't move -- we just stayed in, and we waited to see what happened," Rosemary said. The parking lot of this Lowe's has been taken over by insurance agents: State Farm, Farmers Insurance, and Allstate Insurance were all ready to write checks to policyholders to fix storm-damaged vehicles. "You know what, after a while, they just jump out at you. You see them in your sleep," said Terry Maloney one of the many adjusters tasked with spotting hail damage. Maloney was sent to DFW from Philadelphia. He is one of the many auto estimators brought in from around the country. It's all hand's on deck. His job is to quickly asses the dime quarter and softball-sized damage and make a recommendation. "Well, I'll tell you this, the hail in Texas is the biggest I've ever seen. I've never seen a baseball like that," Maloney said. If all goes well, they'll cut you a check in about 45-minutes. The Insurance Council of Texas puts the total damage at $425 million. 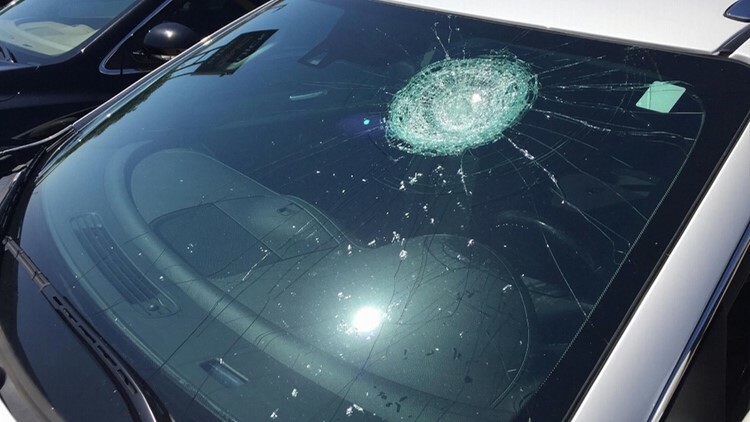 "We know what hail does, and we know how to file the claims, and we know the whole process, so it makes it easier," said Raul Aguayo a representative for State Farm. As for the Fougerousse family, their damage was clear-cut, and so was their check -- more than $4,000. Next stop, body shop.